Tackle DIY tasks and craft projects with a dual temp glue gun packed with safety features. There are two wattages to choose from (higher wattage = more glue with each squeeze), both with low and high temperature settings. There’s a kickstand to keep a hot gun off of surfaces, an insulated nozzle to help protect against burns, and an auto shut-off, too. Dimensions: 60 Watt: 9.5" x 7.5" x 2.5"; 100 Watt: 10.5" x 8.3" x 3"
Weight: 60 Watt: 0.75 lb. ; 100 Watt: 1.05 lbs. Dimensions: 8" x 0.75" x 6.35"
good product! i love the auto shut-off. This is a very nice glue gun. 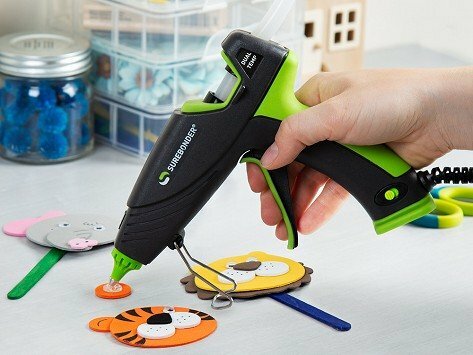 Surebonder’s dual temp glue guns are built to tackle a variety of jobs, from school art projects to putting down carpet, and every glue gun-worthy task in between. The gun comes in two wattages (the higher the wattage, the more glue flow you’ll have) and both have two temperature settings to better suit the material you’re working with. The hotter the glue, the stronger the bond with things like wood, metal, and plastic. Lower temperatures work well with fabric, paper, and foam. There is an auto-shut off function and a silicone tip that helps prevent nozzle burns. A kickstand keeps the gun up off your work surface. The glue guns come from the Kamins family at SureBonder. They have also revamped the staple gun with TriggerFire, their kickback-free version. We appreciate the way they are smartening up these everyday tools to work better and get the job done easier.